Hamish Macdonald is an award winning International Affairs Correspondent for American network ABC News based in London. 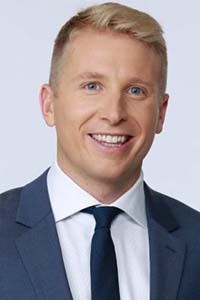 Prior to joining ABC News in January 2014, Hamish worked at Australia’s Ten Network, where he was both anchor of the Late News and executive producer of the primetime program The Truth Is. He also served as the network’s Senior Foreign Correspondent. Hamish’s reporting has taken him all over the world to cover some of the most notable international stories including the uprisings in Egypt, the devastating tsunami in Japan, the ongoing fighting in Afghanistan and the turmoil in Libya during the Arab Spring. He has interviewed some of the world’s most prominent figures from Nobel Peace Prize winner Aung San Suu Kyi to Jemaah Islamiyah’s Abu Bakar Bashir, the leader of the Southeast Asian Islamist group. Completing his Bachelor of Arts (Communication - Journalism) degree in 2001, Hamish has been recognised with numerous awards including the prestigious Walkley Award for Current Affairs Journalism and a Human Rights Australia Award for Broadcast Journalism. He Hamish was named ‘Young Journalist of the Year’ by the British Royal Television Society in 2008 and GQ Magazine named him their ‘Media Man of the Year’ in 2012. Hamish has strong ties to CSU and is one of three siblings to attend the Bathurst Campus and complete a Communications degree along with sisters Kari and Catherine. Here Hamish shares with us the pride he takes in watching his CSU mates achieve and why he’s pleased he didn’t listen to one of his uni lecturers! My childhood was idyllic... We didn’t lock our front door. We knew all the neighbours. And our parents gave us heaps of freedom. I grew up in the Snowy Mountains. We spent winters on the ski slopes and summers in the lake. As a child, I was most curious about... the outside world. I always had a fascination with what lay beyond our tiny, isolated community in the mountains. I chose CSU... because my older sister went there and said it was great. And because most journalists I met recommended CSU. It offered the best journalism course in Australia back then. Still does today. My best experience at CSU... was working in the Radio Newsroom at 2MCE and doing National Radio News. We learnt how to make real radio news programs and to have (probably too much) fun doing it! My worst experience at CSU... was being told by one lecturer that I probably didn’t have a future in broadcast journalism. My voice was terrible, I was incredibly nervous and it showed. He recommended I try print journalism instead. Thankfully I didn’t listen. At university I was inspired by my fellow students... I remember being in awe of the people I was studying alongside. They all seemed so smart, creative and dynamic – how could I ever compete!? I built my closest friendships while studying at CSU and we are still an incredibly tight-knit bunch. One of my favourite things is to be on a big global news story and to bump into someone I went to uni with who is covering the story for another network. I’m so proud of what my CSU friends have achieved. They still inspire and challenge me to this day. Today I’m motivated by... a desire to make big, complicated global news stories relevant and engaging to my own generation. In my profession it is important to care. Care about the story. Care about the people you meet along the way. And care about the people you are broadcasting to. This profession can wear you down, but it isn’t worth doing if you don’t care. I never dreamed I would... do the job I do today and to get a front-row seat watching the world’s biggest news stories unfold. The biggest influence in my life is my family. Mum and Dad have always encouraged me, even when they probably knew better. My siblings and my beautiful nieces and nephews always welcome me home from long and difficult trips. In the future I’d like to... continue shaping the way we deliver and consume news. It has changed so much in my short career. We didn’t even have email addresses when I first started, let alone Twitter. It has been so exciting to be participating in shaping the way big news organisations use social media and engage with audiences in an entirely different way. The best piece of advice I ever received...is to keep a diary of my world travels. And I wish I took that advice. I regret not keeping a personal record of this tumultuous period in world history. The single-most important issue in the world... is peace. We don’t talk about peace much these days. There are wars everywhere I look. It seems ‘peace’ is such a distant concept, but it is the one thing we all want for our families. The thing I wish I had done but never got around to... is going back to uni. I will get there. Eventually. If I could do it all again... I wouldn’t do it differently. But maybe I’d work a little harder when I was studying in Bathurst! One last thing... Remember to be honest and decent. No success is worth anything if you sacrifice your values along the way.